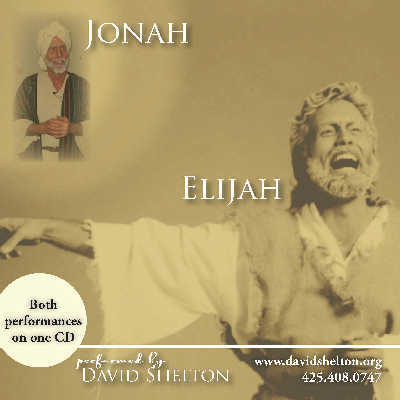 Jonah and Elijah on CD! I thought I'd let you know that the CD arrived at the perfect time. I was slated to work my pizza delivery job tonight, so I was blessed to be able to open my "gift wrapped" CD, pop it in my car player, and travel back in time thru the wonderful portrayals of Elijah and Jonah. I needed that reminder that "one man, one boy, one girl, or one woman" committed to following God faithfully can make a difference. OUR GOD IS SO GOOD! I also loved the challenge to listen if you hear God's push to follow Him in some way and "just do it". God is still using you, David (and Debra), to touch and encourage. Written by Steve Thomas, JONAH! is based directly on the book of Jonah in the Old Testament. David characterizes this historical and somewhat "hysterical" bible hero during the hardest lesson of his life: Obedience. While "Repent!" is the well-known theme of the book (and performance), an applicable challenge for day-to-day Christian living punctuates this performance. Recorded live, approximately 35 minutes. Written by Steve Thomas, David's captivating performance shares the prophet Elijah's experience on Mt. Carmel and culminates with his victory over the Baal priests as he calls down fire from heaven. Taken directly from I Kings, Chapter 18, this sometimes humorous CD is a great encouragement for anyone who is up against seemingly insurmountable odds. Recorded live at a staff chapel at Focus on the Family, 1992.